Nobody has missed the recent surge in Cryptos. If the move in Bitcoin was an April fools joke or not nobody knows, but one thing is sure, price of bitcoin surged and is adding to gains today. Volumes exploded as well. Arguing and explaining the blockchain technology being the future has nothing to do with the recent pop in bitcoin. Irrespective of the pros (and cons) with bitcoin and other cryptos, the price movements of these “assets” is pure speculation. Bitcoin broke above the negative trend and is approaching the 200-day average quickly. 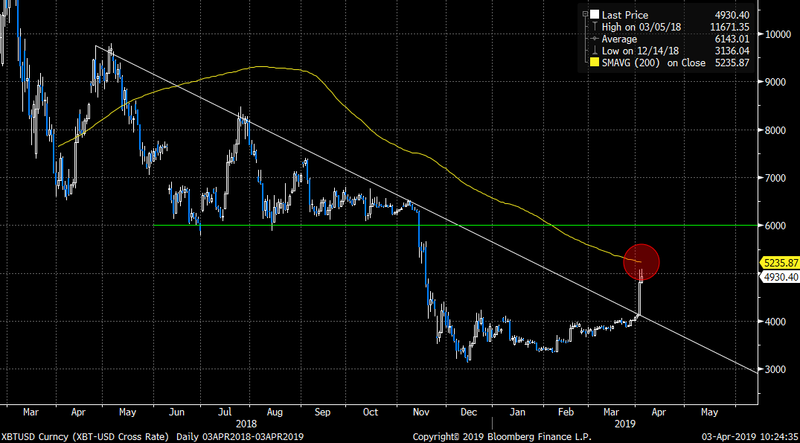 The big “level” to the upside is the 6k area which served as a big support last year, until it was broken. April joke, bitcoin ETF creation, algos chasing momentum can all be the reasons behind the recent pop higher in bitcoin. One theory that has not yet been “suggested”, is whether or not the Chinese recent explosion in “speculation” is a valid explanation? 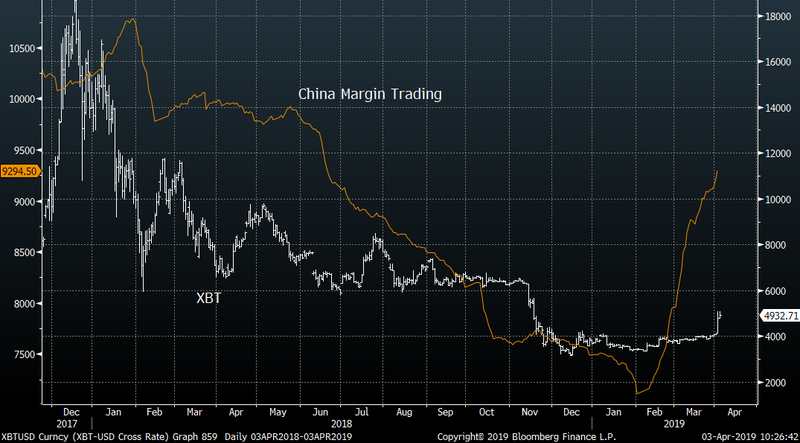 China margin debt has spiked violently higher as the Chinese retail average Joe has been chasing momentum in the Chinese equities space, but could it be they decided trying their luck in bitcoin instead. The chart below shows bitcoin (white) vs Chinese margin trading (orange).